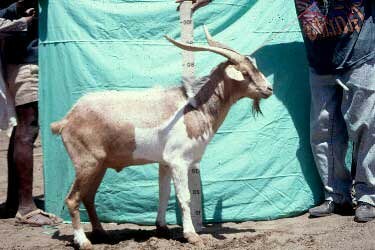 Medium size (65-75cm height) but stocky and weighing (28–34 kg); mostly reddish brown in colour; males have magnificient spiral horns; the hair is short and smooth; all males have ruffs, and beards (94%) (FARM-Africa, 1996). Maintained by the Agew and Tigray ethnic groups of northern Ethiopia, but their distribution is localised along the Tekeze river in the provinces of southern Tigray (Tembien and Inderta), north Wollo (Wag and Raya-Azabo) and eastern Gonder; the climate is semi-arid to subhumid with altituded above 1000 m; the production systems are mixed as well as agro-pastoral (Semien ; FARM-Africa, 1996). Probably originated from early introductions from Yemen and Saudi Arabia (FARM-Africa, 1996).